Our annual search for the best undergraduate research poster gives UCL undergraduates the chance to take their research to the Houses of Parliament in March. UCL undergraduates are invited to submit their research posters for an exhibition in the UCL Cloisters at the end of January 2019. A shortlist will present their research to the panel and all will have the chance to present their research to the UCL community at a lunchtime event during that week. Two outstanding posters will be selected by a UCL panel for inclusion in Posters in Parliament, an exhibition of undergraduate research at Westminster. The two students or student teams selected will present their posters to visitors to the exhibition, including policy makers, researchers and MPs. Staged by the British Conference of Undergraduate Research (BCUR), an open coalition of universities dedicated to encouraging a national culture of research at undergraduate level, the event is designed to demonstrate how research-based teaching can profoundly enhance the quality of the student experience. A key objective of our institutional strategy, UCL 2034, is to give all students at every level the opportunity to carry out research. What kind of poster is expected? 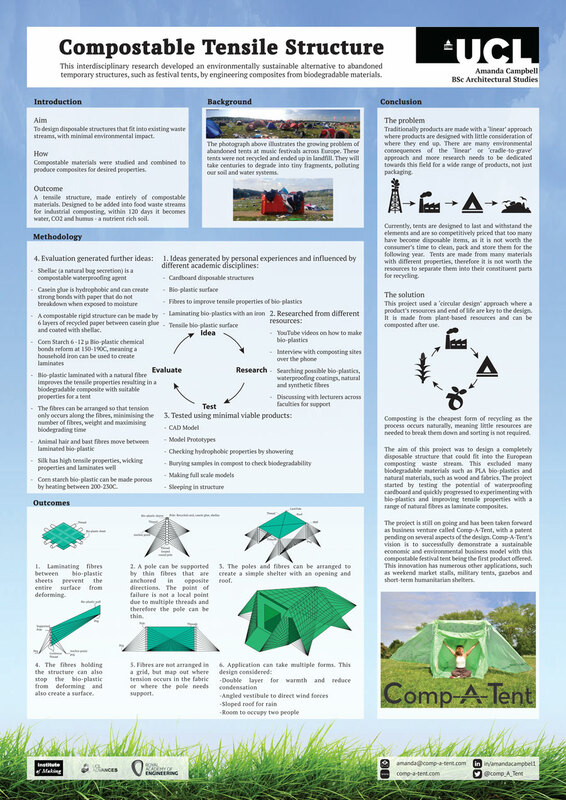 Your poster should be designed to convey the essence of your research in a clear and eye-catching way, to appeal to colleagues as well as non-specialists. The research you present can be work you have carried out as part of your programme of study or outside it, for example as a Laidlaw scholar or as a private project. Selected posters will be chosen to present to a panel. Other submissions will be on display and students will present to attendees. All posters need to be printed, at students’ expense (however departments may be able to help, and should be approached in the first instance). View images in the gallery below and scroll down for more detail and downloadable copies of the posters featured. Alice Pistono, UCL Natural Sciences, presented on DNA degradation under shifting temperature conditions. 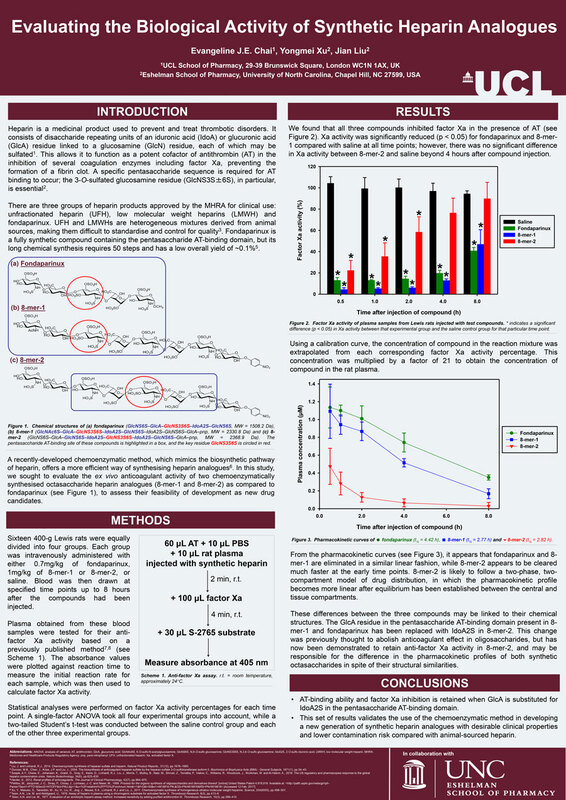 Ana-Maria Ionescu, Delphine Tavernier, Roumyana Kotopanova, Maxim Sverjinski, Gonzalo Valdés Dávila and Samuel Shannon, UCL Biochemical Engineering, presented on Bioethanol production from longline seaweed in the United Kingdom. Read about the event, winers and posters submitted in the Houses of Parliament on 20 February 2018. Read about the event, winners and posters submitted. 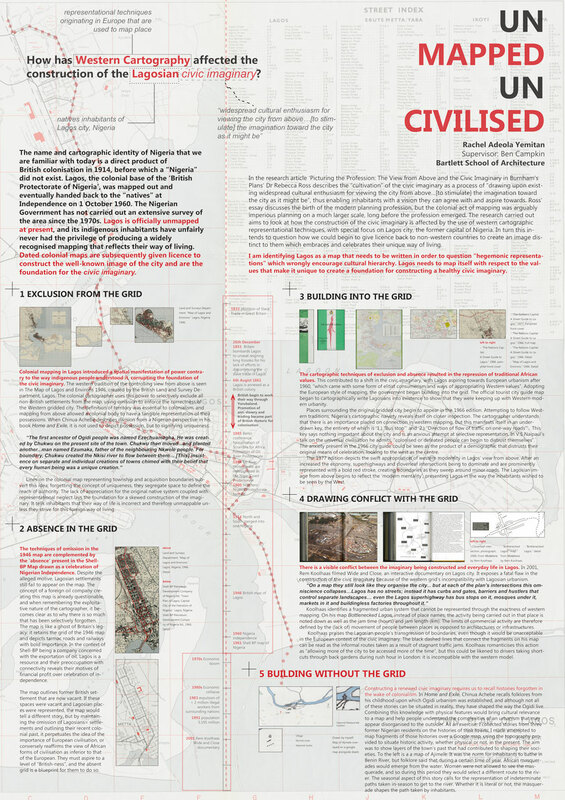 Rachel Yemitan (UCL Bartlett School of Architecture) presented on how Western Cartography has affected the construction of the Lagosian civic imaginary. Evangeline Chai (UCL School of Pharmacy) presented on Evaluating the Biological Activity of Synthetic Heparin Analogues. View the event programme which details the different posters submitted. Amanda Campbell (UCL Bartlett School of Architecture) developed an environmentally sustainable alternative to abandoned temporary structures, such as festival tents, by engineering composites from biodegradable materials. Read an interview with Amanda after she won the top prize at Posters in Parliament. Victoria Monroe (UCL Economics) presented her research on gender disparity in income. As part of the process, we will be holding a screening event at UCL where submitted posters will be on display and two students will be chosen by a panel to progress through to the Houses of Parliament event. You need to present undergraduate work and either be a current undergraduate student at UCL, or have graduated in the last 12 months. Email your PDF, or link to download, to teaching.learning@ucl.ac.uk. An opportunity for UCL undergraduate students to prepare and present a research poster in a competitive process. Finalists will have a chance to present at the Houses of Parliament. Or talk to your Personal Tutor about more opportunities to develop your research skills.